Congratulations Jayedee!! 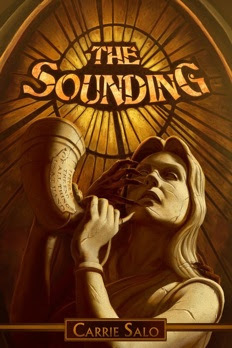 In a few minutes I will be sending you an email--all you have to do is reply with your full name and address within 48 hours and I will forward it on to the publisher who will send you your very own copy of "The Sounding"
The Sounding is Carrie Salo’s debut novel. And what a debut it is!! Her writing style is superb. Now this is what a supernatural thriller is all about----starts off slow and gains momentum with each passing page. This story revolves around “The Book of Revelations”. Whether you believe in this will not matter—but it will scare you with it’s what if type scenario. It takes you from the heartland of America to upper New York State’s farm country to the Vatican to Israel then back again. I finished this book last night—at MIDNIGHT—I could not put it down. It is definitely not for the faint of heart!! I am hoping she comes out with another book soon—I will definitely be reading it. “ IN THE Book of Revelation, a man named John has a prophetic dream. He dreams of the final prophecies that will come to pass—and the seven archangels that guard them. Each angel waits to sound their trumpet at God’s appointed time, preparing humanity to fight and win the final battle. 2000years later, Father Chris Mognahan is a member of the Hetairia Melchizedek, a secret society within the Catholic Church that studies Biblical omens. The society asks Chris to investigate an unusually grotesque crime—a murder on a college campus where the killer’s hand literally burned off the victim’s face. While the killing seems isolated at first, the society ties the murder to the final Biblical prophecy and a terrifying omen that the order of the prophecies is about to be disrupted. The final battle is coming soon—long before humanity is prepared to win it. Suddenly, Chris finds himself fighting against time and hell to keep the prophecies in order and stop an early Armageddon. He is joined by a band of unlikely allies, and together they find themselves in Rome above the Vatican Necropolis—the City of the Dead—where the future is revealed to them in ancient texts. They are not alone, however; an evil as old as time itself hunts them. As they travel across continents on their mission, the demonic force follows relentlessly, waiting in every shadowed corner and every dark place. One VERY lucky reader will be winning this book—Just remember to put your email in each and every comment you make so I will be able to contact you if Random.org comes up with your lucky number. You will have 48 hours to reply to my email. she is an advertising copywriter. "By day she is an advertising copywriter and account manager." She is an advertising copywriter and account manager. I follow Carrie as Susan Sullivan on FB. Hey everyone...just an author checking in! :-) Thanks so much Miki for the great review. I am so glad you enjoyed The Sounding, and that it kept you awake! Good luck everyone with the giveaway. Carrie Salo works as advertising Copywriter and Account Manager. I am following Carrie and you on Facebook my user name is Larisa Kudisheva. I am signed up via RSS my email is larisa.kudisheva@gmail.com. I have liked your post. I have tweeted https://twitter.com/#!/Lora316K/status/163913160754077696. thanks for another great giveaway! carrie is an advertising copywriter and account manager, by day! She's an advertising copywriter and account manager.